What do preschoolers need when they are ready to lie down and take a nap? 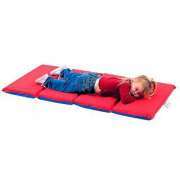 Rest mats create the perfect space for naps and snoozes in your preschool or daycare. They are lightweight yet comfortable and very easy to set up when you need them. 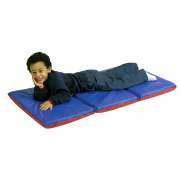 Nap mats are essential for any early-childhood setting. 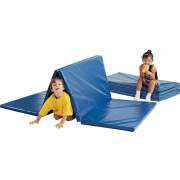 They provide tired young learners with a cozy personal space within the classroom. Hertz Furniture&apos;s selection of nap pads includes a number of styles and colors so you can choose what&apos;s best for your school. All of our nap mats are designed for many years of safe use and enjoyment. What will help children calm down at school during naptime? It is important to make sure that each of your young students has a personal space to lie down during nap time. When each child knows exactly where they are sleeping and which rest mat is theirs, it is easier for them to quiet down and doze off. An organized rest hour will make a more calm and peaceful period for both caregivers and children. Thinking about how naptime will be arranged when deciding on preschool classroom design is definitely a good idea. 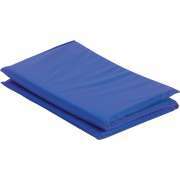 What kind of padding should kindergarten nap mats have? Nap mats should have ample padding to give little ones cozy support as they rest up. 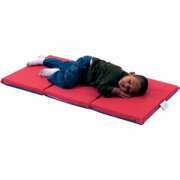 Our rest mats are padded with cushy foam which supports children or toddlers as they sleep. The right padding will help children fall asleep more quickly and sleep for longer amounts of time. Great rest mats show children that you care about them, and demonstrate that they can be just as comfortable at school as they are at home. 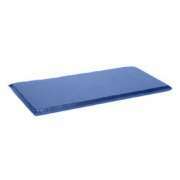 The vinyl surfaces of our kindergarten nap mats are designed for enduring safety and health. The style of stitching and properties of the material prevent buildup of dirt and germs. This necessary health precaution prevents little ones from catching each other&apos;s sniffles or colds. 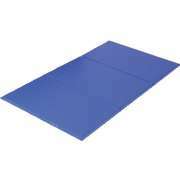 Vinyl is also easy to wipe down if nap pads get wet or dirty, and prevents moisture from sinking into the foam padding. How can I make sure rest mats don&apos;t get mixed up? Nametags are always convenient to have on your nap mats. If you have a class with many young students, and multiple daycare nap mats in the same color, it is important to make sure that it is easy to identify whose is whose. Nametags teach the value of respecting personal property, encourage children to identify their own names in writing and prevent potentially upsetting mixups. Our rest mats come in a number of different styles. You can choose either three-fold, four-fold or no-fold models. Foldable preschool nap mats are good for compact storage when they are not in use. Alternatively, the no fold design is better for stacking, especially if you want to use one of our great transport solutions. 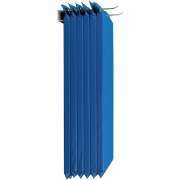 What is the best way to store rest mats? For easy storage and mobility, we offer both a storage trolley and a heavy-duty nap mat caddy. 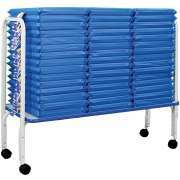 Each of these choices offers an excellent space for your preschool mats, and makes it easy to roll them to any location where they are needed. The carts can remain in storage with the mats inside, which makes it easy to keep all of the mats that belong to the same class in one location. If you prefer to keep your kindergarten nap mats in the classroom, or you simply don&apos;t need a mobile storage option, the wall-mount hanging system offers another way to keep rest mats handy. This convenient solution uses wall space rather than floor space and can be put right inside your classroom. With nap mats hanging conveniently on the wall, they will stay out of the way when not needed and be right where you want them when they are. Hertz Furniture&apos;s nap mats will provide your young students with a comfortable place to rest during the busy day. We offer rest mats from reliable manufacturers that specialize in early-childhood and school furniture including Mahar Manufacturing and Children&apos;s factory. If you need help choosing the best options for your students and classroom, contact the Hertz Design Center for free project-planning advice.